Are you overthinking to the point of paralysis and fear? Is your mind filled with so many thoughts that you don’t know what to do next or how to handle it? If overthinking is causing you to struggle, you’ll be glad to know that it’s possible to find mental peace again. You can learn to calm your mind, achieve greater focus, and find the direction that is right for you! Avoid obsessing about completely silencing the mind. You may wish that you could stop your thoughts altogether. However, this isn’t the best tactic for dealing with overthinking. The more you ponder on how to stop overthinking, the more your thoughts will flow. The opposite of what you want actually starts to happen. Understand that you’ll always have thoughts. All human beings have thoughts. Recognize this is a normal process. Although you can learn to silence your mind in certain situations, you can achieve great peace by learning to take control of what you think, instead. Avoid judging your thoughts. It’s tempting to get upset if you have negative thoughts or emotions. You may be quick to judge and try to squash them. Instead of judging and criticizing your thoughts, accept them for normal human emotions. Acknowledge them and then move on. Learn to love your mind. This will help your mind calm down because you won’t be fighting internally. Remember, you wouldn’t be able to appreciate the positive thoughts if you never had negative ones. Try to stay present. Overthinking often comes because you’re worried about the future or regret something that has already happened. You allow stress and anxiety to take over. You start imagining different outcomes, with most of them being negative, and you start living in fear. If you stay in the present moment, then fear can’t take over, and overthinking isn’t an issue. You’re able to focus on what you have to do each day to survive and thrive. Be okay with the world. The word okay doesn’t mean perfection. It also doesn’t mean awful. It’s the balance between positive and negative. It’s the thin line between them that allows you to find mental peace. Being okay also means that you learn to accept what is happening in your life. Being okay may mean that you learn to love where you’re at and what you’re doing right now. You learn to appreciate what you have and the people around you. It’s important to find gratitude in the little things. You don’t have to pretend that negative things don’t exist, but you can avoid focusing on them. Center your attention on appreciating life. Now you know how to stop overthinking. Your thoughts can save you, but they can also destroy you. Your mind can be a busy place, so it’s important to learn ways to deal effectively with some of the thoughts. 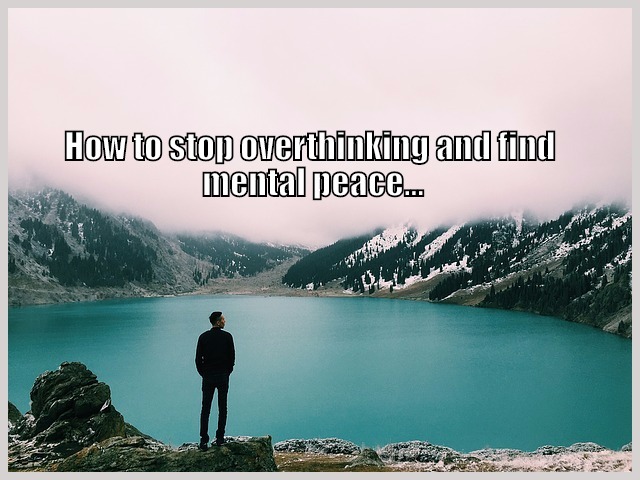 Strategies like these can help you deal with your overthinking so you can find peace. Are you looking for more information? Follow T. Harv Eker’s 3 Day Life Makeover course! Or check my review here first.